When my husband and I set out on a pilgrimage, I write my hopes and intentions for the trip, but the actual theme of the pilgrimage often emerges during the journey. My hopes for this second visit [see first visit here] to our Anishinaabe-Ojibwe cousins on the Lac Courte Oreilles (LCO) reservation in northern Wisconsin were to deepen our relationships with all our relatives – with our human family, with the plants and animals, and with the land and waters of this beloved place. I wanted to broaden my experience of the culture of our tribe and learn more about their lifeways, both material and spiritual. On some journeys it takes awhile, but the theme of this trip emerged almost immediately. Arriving on an evening in mid-July, we took cousins Sylvia and Lori out to dinner for Sylvia’s birthday. We ate walleye, a fish that is important to the Ojibwe, at The Landing, the tribe’s restaurant on the Chippewa Flowage. But with characteristic generosity, they gave us presents of local wild rice and maple syrup. After dinner, sitting together at their home on Little Round Lake, we watched a PBS cooking show called “Family Ingredients.” It featured Sylvia’s daughter Val describing her fondest food memory growing up on the reservation: gathering her favorite wild food, weiwaagaagin (fiddlehead ferns), in springtime. In the film we meet wild plant gatherer, Paul DeMain, as he and Val pick fiddleheads, putting down sacred tobacco as a gift of thanks. We also meet Tashia Hart, a culinary ethnobotanist who is part of an emerging movement of young Native American chefs who are bringing indigenous foods into a new gourmet cuisine. We watch her make wild rice patties coated in ground hazelnuts cooked in sunflower oil and then spoon over them a pesto made with blanched stinging nettles and fiddleheads, seasoned with sumac. Oh, to taste all these wild, native ingredients! We also hear Sue Mindel, the manager of the tribal farm, describe the farm’s growing collection of indigenous seed varieties. 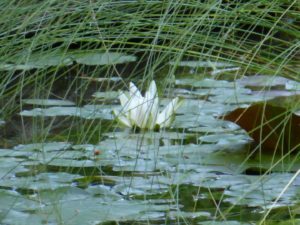 The next morning we enjoyed some quiet moments at a serene lakeside boat landing, surrounded by the plant life of the still waters, blue pickerelweed, yellow pond lilies, and white water lilies. The banks were covered with graceful, waving marsh grasses dotted with pink milkweeds and white paper birches, those beautiful, iconic trees of the north woods. A phoebe and a common yellowthroat called out across the marsh. Then we went boating with Lori and friends on Big Round Lake, seeing “the narrows” where traditional nighttime spearfishing of walleye takes place in the spring. We were surprised by its size when one of these big fish swam under our boat! After visiting the Mission and purchasing some of the beautiful beadwork for which the Ojibwe are justly famous, we went to the Trading Post to talk to Paul, mentioning that we had seen him in the film. He told us about the wild foods they gather sustainably and talked about the importance of getting people back out into the woods so American Indians can regain their food sovereignty. He gave us the newspaper article he’d written about the recent Great Lakes Intertribal Food Summit: “A couple hundred participants, almost three dozen Indigenous chefs, gardeners and farmers met . . . to work with traditional foods and medicines.” Many of the ingredients were harvested from the fields and forests within a small radius of the conference. “Some chefs are picking up from where a great-grandmother left off as confinement to the reservations took place and government introduced commodities then dominated the diets of many American Indians for several decades.” Paul showed us syrup they made from tapping both white and yellow birch. It takes one hundred gallons of birch sap to make only one gallon of syrup, he said, so sometimes it’s combined with maple syrup to get the benefits of their shared properties. He brought out a big piece of chaga, the medicinal mushroom that grows on white birches. I think that’s when I realized that the theme for our trip was going to be native foods and medicinal plants! That evening we went back to The Landing and watched cousin Lori and other dancers in regalia perform for tourists, creatively engaging all the children in the dancing. The next morning we met some folks at a wayside landing to go kayaking on the Namekagon River. 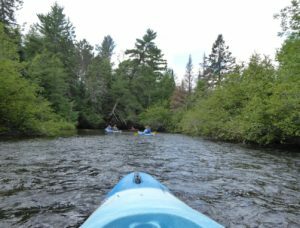 The Namekagon is part of the St Croix National Wild and Scenic Riverway, which flows southwest into the Mississippi (nine wolf packs, thirty bald eagle nest sites, all forty native mussel species still present). The river was low, so it was challenging to avoid rocks (and to wiggle our way off the rocks we got stuck on). There were countless little rapids to negotiate, which made paddling exciting. An osprey kept flying ahead of us from treetop to treetop. A hawk flew across the river. Purple and pink milkweeds, tall Joe Pye weed and white Ceanothus bloomed along the edges. Riverside meadows of light green, sunlit grasses and sedges filled some areas, alternating with dense shrub lands of alder and bayberry. Cedar waxwings nibbled berries. Flowering rushes lined the river below tall, dark spruce, fir, and pine trees. Long, flowing eel grass streamed golden in the clear reddish waters. Turtles basked on a log. Rounding the bend near our pull-out we came upon a bald eagle surveying us from his post in a pine tree right above our kayaks. Cousin Lori took us to the LCO farm, where we spoke with Sue, the manager, who was also in the film. My ears perked up when she talked about “rematriating” their foods. She showed us their indigenous seed collection, telling us the stories about each precious variety, such as Hidasta Shield Beans and Mohawk Red Bread Corn. We saw Bear Island Ojibwe corn kernels that were found in a clay ball 850 years old, given to Winona La Duke, who passed some on to Sue. She took us on a tour of the no-till fields where they are growing these varieties and discovering their characteristics, such as that Dakota Yellow Dent Corn withstands frosts. Ten percent of the farm is set aside for pollinator gardens where they’ve so far identified 74 native bee species. Honoring ancestral seed varieties and making sure they are not lost is part of reclaiming food sovereignty for many peoples. After dinner at Lori and Sylvia’s with other cousins visiting from Seattle, we all went to the Honor the Earth Powwow. 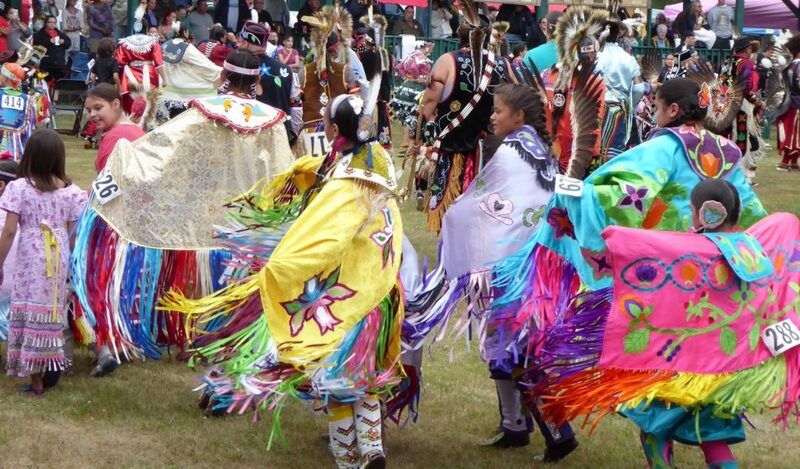 I was again amazed at the beauty of the beadwork and the colorful satiny appliqués on the people’s regalia. The incredible creativity, the love, the time, and the skill that goes into making these costumes for the dancers, from the tiniest children to the most dignified elders, is so inspiring! Taking Lori back home, we were excited to see a small black bear walking along the side of the road. Then on the way to our motel we had to slow down for a very large bear emerging from the forest like an apparition in the blackness of night. 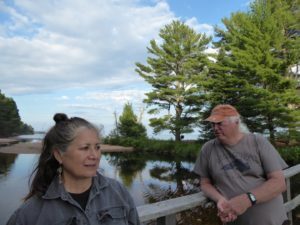 On Saturday we drove to the nearby town of Cable with Lori to see the wild rice (manoomin) beds where she harvests rice at the Pequaywong Flowage on the Namekagon River, a beautiful but small remnant of the once vast rice beds of this area, which were destroyed by dams and logging. We visited the Cable Museum of Natural History, where we saw colorful pollinator gardens and a large exhibit on native bees (166 species here in northwest Wisconsin!). 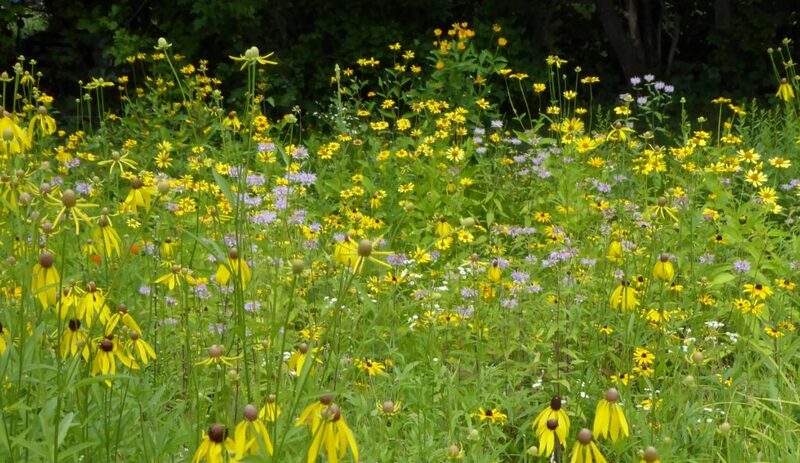 I don’t know why they need to promote pollinator gardens when the roadsides here are full of native pollinator flowers: pearly everlastings, black-eyed Susans, lavender monarda, yellow coreopsis, tall pink fireweed, white yarrow, eight foot high native sunflowers, and great swaths of the beautiful red plumes of staghorn sumac! We drove on to the Clam Lake area to look for some of the reintroduced elk, but didn’t see any. On our way back we did see two turkey hens with about ten little ones eating their way up a steep slope and disappearing into the woods above. Back at the lake we sat listening to the calls of the loons resonating in the cove and admiring Sylvia’s delightful paintings of Grandfather Chief Nenaangebi and Ashaweia, his daughter, from whom they and my husband are descended. “Ashaweia is making a water blessing ceremony,” Sylvia explained. I’m grateful that we share respect for and honoring of these our ancestors. Later we went to the second night of the Powwow. We especially enjoyed the huge Snake Dance as the announcer told the story of Ojibwe culture hero Nanaboozhoo and his friend the Snake. 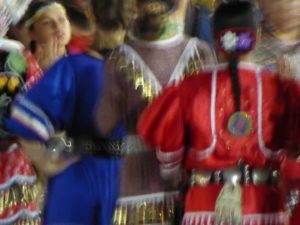 As the snake line of dancers passed we heard the higher sound of a couple hundred ankle bells rattling on the men’s traditional costumes, followed by the lower rattle of the thousands of jingles on Lori’s and a hundred other jingle dancers’ dresses. We sat mesmerized as over eight hundred dancers in regalia coiled and uncoiled, spiraling their way around the arena, then separated into two lines, dancing the story of the Snake shedding its skin and crossing the river upon its death to join Nanaboozhoo in the spirit world. Hearing a timeless story of Snake while seeing Snake come to life through the dancers, I felt a sense of wonderment and mystery. Another day we took a walk with our cousin Lawrence on a lovely trail through a diverse forest. When we came to a grove of hemlocks, he said being in a hemlock forest can induce feelings of love and happiness as no other forest can. Seeing sweetfern he told us that it’s used to line caches, as it is a natural insecticide. Standing beneath a balsam fir he said the resin is powerful medicine, but when I inquired, it was clear that its use was not to be revealed. “No one medicine person knew it all; each had their own medicines, their own healing magic.” While telling us that in June, when the wild strawberries begin to ripen, the white birch bark begins to loosen and is gathered, he related the story of Nanaboozhoo and the Thunderbird. Cutting off a piece of bark from a downed birch tree Lawrence showed us the image of the Thunderbird in the underside of the bark. The birch tree is a protector. You will never get struck by lightning under a white birch. “It’s the one tree I won’t strike,” said Thunderbird. Birch bark, wiigwaas, is waterproof, hence canoes and containers can be made of it. It also burns whether it’s wet or dry, so it’s a good fire starter. Hearing a timeless story of Thunderbird while seeing Thunderbird come to life through the birch tree, I felt a vivid sense of the sacredness of the forest around us. Arriving at a beautiful, sunny tamarack bog, we saw many wetland plants such as blue-leaved bog rosemary, bunchberry and white water arum. 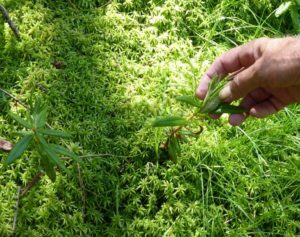 Lawrence pointed out mashkiigobag, swamp or Labrador tea, a traditional beverage and a medicine. Medicinal cures are not spoken of, he said, unless there is need or within a family group. 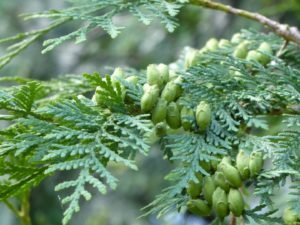 Continuing, he explained, “There are four of everything in the Ojibwe Way, and in this there are four ways to get the medicine knowledge about plants.” The first way is if you are sick and need the cure, and you get that information from a medicine person who has authority to impart it. The second way is to get the information from an elder or family member who trusts you to use the knowledge respectfully. The third way is to receive the cure through a dream. The fourth way is to receive the cure from the spirits through a vision. “All of these are respectful of the plant (and all of life, including all those things not seen),” he said, “and tobacco is always put down, which is called “laying a feast” for the plant. If you know the things to say at this time, you say them, and if you don’t, hold in your heart respectful thoughts.” On the far edge of the bog I could see white cedar (giizhik), another tree considered sacred. I was grateful to him for these teachings. 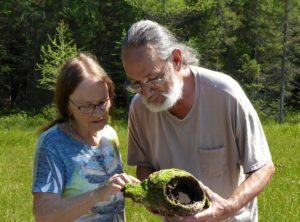 We shared the love we feel for wetlands and for this spacious, open tamarack bog carpeted with red sphagnum moss, purple pitcher plants, and many other bog species I hope to learn. Returning from our walk we made a small gratitude ritual, me praying in English, Lawrence in Ojibwemowin with tobacco. At his home near Spring Lake Lawrence showed us the many varieties of apple trees and the blight-resistant chestnut trees he’s planted, the maples he taps for syrup, and the huge white and red pines on his land. Continuing to share his deep connection with trees, he showed us the wiigiwaam his son made of bent ironwoods. They put spruce inside along the bottom edge of the covering against rodents and snakes, then pine, then white cedar. He brought out the smooth, pure white sumac walking sticks with black designs that he carves. From his garden we ate big blueberries (miinan) and gooseberries. Pointing to yarrow, which he called ajidamoowaanow, or “squirrel tail,” he said he uses the “male” leaf (rather than the “female” flower). Saying it is a dream plant, he told us a powerful dream, which conveyed to him that he would be “a plant person.” Once again I was reminded that for traditional people stories, dreams, and visions remain real and present in the heart and are often woven into the flow of meaningful expression in the moment. Recalling the amazing childhood experiences Lawrence had told us, and about which he has written a wonderful story called “Brother Wolf,” I asked if there are any wolves around. He said there is a wolf pack in the nearby Minong area. Hmm, Minong, place of good berries. We picked up Lori the next morning and drove up to Ashland on Lake Superior (Gitchi-Gami). We spent some time with helpful people at the Bureau of Indian Affairs researching my husband David’s descent and finding out more about his small piece of reservation land. While there, we talked to a man from the neighboring Bad River reservation who had inherited the principle right to harvest wild rice from his father and grandfather. The Kakagon and Bad River sloughs, 16,000 acres of high-quality Lake Superior wetlands that have been called the Everglades of the North, were recently recognized as a Wetland of International Importance, the first such site to be owned by a tribe, which they hope will help protect it. Bad River Tribal Chairman, Mike Wiggins, Jr., has explained the significance of the rice sloughs saying, “[This] wetland complex represents everything our Tribal People hold dear and sacred on many different levels. Spiritually, the ‘place’ and everything it has, the clean water, the wingeds, the seasons, the rice and fish, connects us with our ancestors and the Creator. The sloughs sustain the physical well-being of our community with foods such as wild rice, fish, cranberries, waterfowl, venison, and medicines. From an Anishinaabe world-view perspective, the wetlands ecosystem is a tangible representation of our values of caring for the environment.” Wild rice habitat sustains an incredibly diverse family of plants, animals and people in a whole web of kinship relationships. Preparing for a visit to Madeline Island, we went to pick up JT, John Thomas Nahbenayashe, an old friend of Lori’s, toured his lovely garden, (a rabbit and a chipmunk scampered by), and ate lots of his delicious ripe raspberries! JT, a member of the Sault Tribe in Michigan, is a historian and educator dedicated to the empowerment of Native Americans. We drove north along Lake Superior to Bayfield, and ate whitefish on the deck of a restaurant overlooking the ferry docks. “So fresh it was sleeping last night in Lake Superior,” the menu proclaimed. 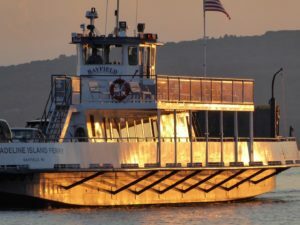 Prior to European colonization, Madeline Island was the cultural, economic, and spiritual center of the Ojibwe. We took the ferry over to the island, which is sacred to the Ojibwe as the last stopping place on their migration from the East. It was prophesied that the people would settle “where food grows on water” (i.e., wild rice). In the town of La Pointe we visited the museum and admired the historical Ojibwe beadwork. We bought a braid of sweetgrass (wiingashk) for a friend. JT shared this Ojibwe belief: “Sweetgrass is the hair of our Mother the Earth. Each strand alone is not strong as when braided together. All life is sacred.” Yes, we are all related, all braided together. Since sweetgrass grows in wet meadows, edges of bogs, shaded streambanks and lakeshores, all those wet habitats where we walked and kayaked, it‘s possible that sweetgrass was growing all around us, but I have not yet learned to recognize it. My father, I was here last year, when the treaty was made, and I swallowed the words of the treaty down my throat, and they have not yet had time to blister on my breast. The 1854 treaty resulted from an 1852 voyage, partially by canoe, from Madeline Island to Washington D.C. by the 92-year-old Chief Buffalo and a small contingent of Ojibwe men to try to stop plans to remove the Anishinaabe from their Lake Superior lands. The delegation succeeded in getting a meeting with President Millard Fillmore and persuaded him to rescind President Zachary Taylor’s order to remove the Ojibwe people from their land, thus averting another, earlier, forced removal tragedy. In recent years, the Ojibwe heritage of the island has been increasingly acknowledged in special gatherings. Recently La Pointe became the first town in the region to incorporate bi-lingual Ojibwe/English signage, part of a renewed effort by the Ojibwe to try to save their language, which was forcibly removed from their children in government boarding schools. The tribes recognize that regaining and retaining their language is crucial to their identity, their mental and emotional health, the maintenance of their ceremonies and traditions, and their very ability to pray to the Great Spirit, Gitchi Manitou. The least I can do is try to learn a few words. We walked on the beach along Lake Superior’s Chequamegon Bay (pronounced “shawamegon,” the original Ojibwe name for this area) and stood together on the wooden bridge that crosses the estuary, gazing at the fertile lagoon and listening to green frogs twang. Perhaps the lagoon reminded JT of the rice sloughs, because he told us a story about the week he spent ricing with his aunt and uncle as a child that included helping rescue his uncle who fell out of the canoe while poling it through the rice. The astounding experience that ensued was so visionary in quality I thought again of Lawrence’s guiding childhood experience with Wolf and of how these visionary experiences continue to be so valued and so present. On our last day we met Lawrence for a walk at the Chippewa Flowage on a lakeside trail called Mino-giizhigad, “It’s a Good Day.” On the uplands we ate lots of wild raspberries and saw scads of hazelnuts ripening. Long-legged man that he is, Lawrence took off on deer tracks as we straggled along behind him up and down hillsides and gingerly picked our way along the edges of a hidden wetland. Spotting some wintergreen, he said, “We eat these berries for energy!” Then he led us climbing over and under bushes, examining every plant along the narrow sandy margin of the lakeshore, looking for a certain medicinal plant. Here we were, cousins happily sharing our love for the wetlands and shorelines of these beautiful and vast lakes. It was, indeed, a good day. We shared big hugs that would have to last for perhaps another year. We were sad to leave. As he went off to gather some medicines he said, “Giigowabamin, May your life be good.” “Minawa, Your life also good,” we would say in return. Back at Sylvia and Lori’s, we ate delicious bluegill fish, afterwards sitting on the deck watching the sun set and listening to the calls of the loons echoing across the lake, my mood matching their mournful sound. A great blue heron flew toward the setting sun, and a bald eagle flew toward the risen moon. I’m grateful for this, our whole community of relatives, gakina-awiya. Despite many years of exploitation of this colonized land and mistreatment of the people, the inherent, underlying spirit of this glacier-carved landscape is radiant. The near constant presence of water in its many forms, lakes, rivers, wetlands, bogs, is revitalizing. I sense the presence of a great spirit of healing enveloping us all. Giigowabamin. What a great story. You are really getting the feel for the life of your Objibwe relatives. I love the focus on sustainable foods, especially ones from history. And the vision of 800 dancers is quite spectacular. All of this is so precious and real. Thank you for writing, for recording and sharing these remarkable experiences. I can’t wait for the book Betty Lou! Mariah, thank you! You are such a wonderful encourager of artists in this community. You help each and every one of us develop our gifts. Yes, we are so fortunate to be with these wonderful relatives, our human and other-than-human kin. May we all nourish and be nourished by our native lands. you and david are truly lucky to have such a rich experience. i would love to experience the rice sloughs! Yes, RD, I hope to share these experiences in a respectful way that somehow helps with healing. Their whole way of life was centered around the rice and it is truly tragic that most of the rice beds were destroyed. I’d love to participate in gathering wild rice some day. I enjoyed this account of your recent pilgrimage. How fortunate on many count Steps! You connect with family, with traditional culture, learn food and healing ways, enjoy beauty different from the familiarity of home…and more! Thank you for sharing your trip. Marsha, thanks for reading and for your response! We have barely begun to explore the beauty of our people and their gorgeous lake-filled lands. There is so much to learn, and I hope we can honor that which we have been shown. WoW! Beautiful – sounds like Eden. I use to live in MN and wondered if Chippewa was an Anglecized pronunciation of Ojibwa. They seemed to be used interchangeably and it is easy to hear how Ojibwa could become Chippewa! Your writing is lovely and compelling to read! Thanks for this! Oh, hi Jude! Yes, Ojibwe and Chippewa are used interchangeably by the people. For example they call themselves bands of the Lake Superior Chippewa, but refer to their language as Ojibwemowin. So, you know how beautiful it is up there! Thanks for your kind words. So special. The photographs are spectacular and your prose just lovely. It really captures the intensity of the experience. Thanks, Marcia, for your encouraging words. Yes, the intensity you picked up on is just the tip of the iceburg of the deep mysteries of the culture of the people and the healing qualities of the land. Such an amazing journey and journal entry. Thanks for sharing your story and photographs – both beautiful and moving. It’s always inspiring to learn of how cultures that have been oppressed are reclaiming their heritage and lost practices. Blessed Be ! ! And, OMGosh – ‘….wild rice patties coated in ground hazelnuts cooked in sunflower oil and then spoon over them a pesto…’ Wow, I would love to taste that ! ! Yes, Kathy, it’s a difficult and courageous effort to try to save and revive what colonization destroyed. Thanks for affirming this work. I hear there are some indigenous chefs in Minneapolis, so next time we go there I’d love to taste some native foods, too. Or maybe next year on the reservation! Beautifully written and illustrated! 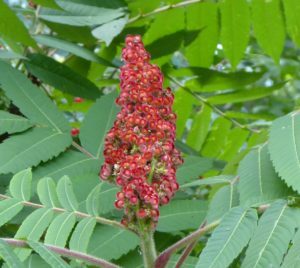 I loved reading every word, and was reminded how important it is to know the local plants, seeds, and berries that are available in the areas where we live. Thank you for sharing this beauty and wisdom of the land and the people. Thanks for your kind words. Yes, Sharon, loving and appreciating and, as you say, knowing the native Place in which we are planted is an aspect of reclaiming our indigeneity, our rootedness in sacred Earth. Yes, ZubinNur, the land and the people who love the land have so much to teach us every single Place on this beautiful Earth. May we listen and learn, as you say, because the beauty, the healing, the love that the Earth offers us needs to be received for our sake and for hers. Thank you for being a receptive listener to her, too! Your words hearten me today, Labor Day, as I spend a last few hours working on planting natives and removing invasives on ancestral land on Burton, Ohio. Our connection with the plants and geology and people of our forebears’ land feels essential to our healing. Your wonderful story of local knowledge, sacred remedies, indigenous recipes and ceremony gives me hope in these times. I am delighted that this is part of a book in the works. Barb, thank you for underlining and emphasizing that the love-work of tending the land also honors our ancestors, as it is their beloved land. And, yes, Barb, in this work of re-connecting with our ancestors of the land lies the potential for great healing. I am grateful to you as a way-shower in this important and heartfelt work. Once again, I am amazed at what you were able to take away from your short stay here. Beautifully written. Thank you. Sylvia, it is such a pleasure to get to know you and to share some of your life on the reservation. We have fallen in love with the land of our ancestor Ashaweia and are delighted to learn so much from your knowledge of her and of the land. Thank you. Once again you have transported me with well-chosen words and incredible pictures, this time to a place that in my childhood we called “the North Woods” and I waited all year to visit there for a few days. But the North Woods you are seeing now, under tribal care, is so much more whole than the shattered rez I glimpsed as a kid. Yes, Vakil, and I hope and pray for that healing and wholeness to continue and deepen so the people can live and the land can live in a mutuality of sustenance. Well, I pray for that for all endangered cultures and endangered lands. You’ve so vividly and descriptively taken to me to this part of the US, touching upon my enthusiasm for edible and medicinal plants and for holding land and all beings sacred. Thanks for your response, Jill. I would like to hear more about your ancestors in Minnesota and their experiences of the place and the people at that time. 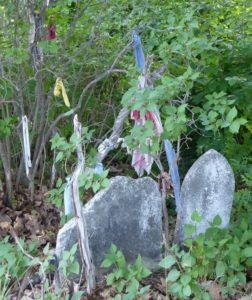 I love that we share an ancestral connection and would love to honor this, honor them, somehow. 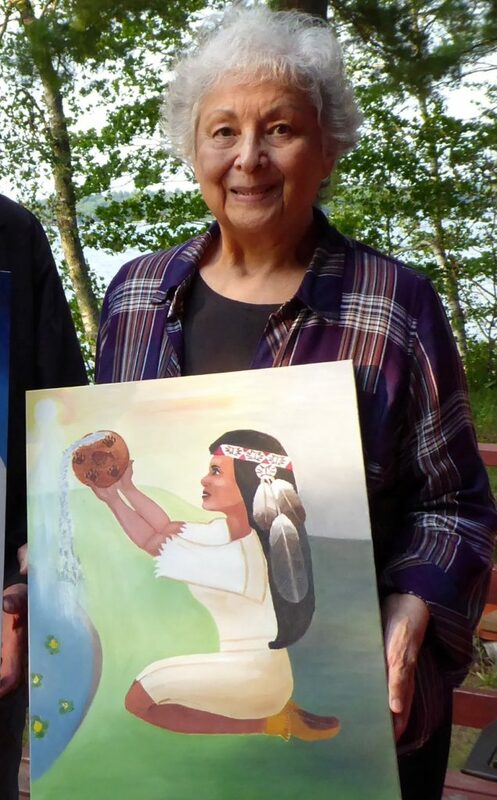 Thanks Betty Lou for taking the time to share of your pilgrimage and give voice the many other-than-human kin who are part of the larger Ojibway community. Beautiful to read of the healing and cultural recovery and renewal efforts there. Grateful for your service and voice here friend! 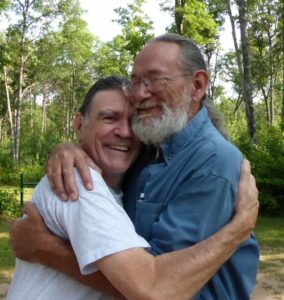 Daniel, thank you for all your wisdom and heart in teaching me to to relate deeply to these Ojibwe ancestors, and to honor respectfully the loving spirits and the other-than-human persons of the land. May your work in teaching Ancestral Medicine and Animism spread far and wide, as it is so needed in these times.